The Parish Calendar for January is dedicated to the Feast of the Epiphany. 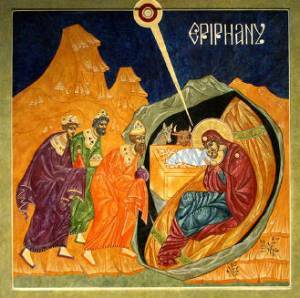 Let us ponder on the Wise Men who read the sign of the times and journeyed to see the child Jesus with sacred gifts. Let us remember their courage, faith and ability to discern the presence of God born into our world. We too are called to read the sign of the times. Let us recognise the presence of the Christ child among us. As you have accepted us when we did not deserve your love, will you help us to accept those whom we find it hard to love? Forgive us, O Lord, for any attitude that we harbour that on any level sees ourselves as better or more righteous than others. Will you help us to remove the barriers of prejudice and to tear down the walls of bigotry, religious or social? O Lord, help us realize that the walls that we erect for others only form our own prisons!